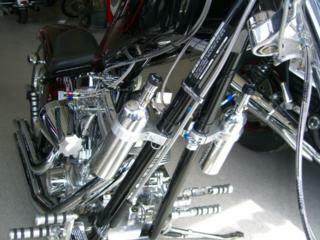 This nitrous system is made for Harley and Victory carburated motorcycles. NOTE: For use on single carb engines with a single to dual outlet intake shapped like a "Y"
This DynoTune wet kit will add up to an additional 150HP* to your Ride(*with a seriously modifyed motor). Comes with eveything you need for a complete installation including twin bottles and brackets. Billet Bottle brackets that mounts to a tube on the frame. This wet kit uses a small fuel pump and will mix nitrous and fuel right at the carburator outlet. Comes with two jet settings of 18HP, 34HP others are available from DynoTune. The Nozzles are DynoTune's famous Tomahawk nozzles with side inputs so the lines can be routed cleanly back under the bike. Kit Comes complete with instructions on how to install your Nitrous system. Nozzles mount between the carb and the engine on the metal intake. -- Electrical kit with switches, terminals, wire etc. -- Purge kit with "V"nozzle, mounts on front of bike.